This new book by acclaimed ski author—and Realskiers Editor—Jackson Hogen and Snowbird “Guru” Dave Powers is unique. 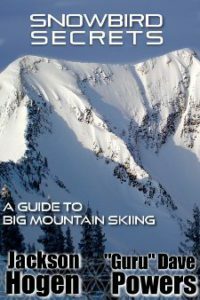 One could argue that the title is coyly misleading: The “Secrets” are secret to elite skiers only in that they have not before been so clearly articulated and, although this remarkable book centers on Snowbird, it reveals far more than mere tactical approaches to that iconic big mountain playground. And as to Big Mountain Skiing, “Secrets” applies to all skiing, from local bunny hill to the vast reaches of the Chugach. Hardware—boots, skis, bindings—and software—skills, technique—and tactics—where to use what hardware and which skills—certainly are central to effective skiing performance, but, by far, not the whole story. Context, mental environment and, especially, the concept of Flow are as, if not even more, important. “Secrets” is the first volume of which we are aware to address these crucial concepts and we believe it to be among the most important skiing books yet written.